SwissBullion.ch sell the Panda coin series manufactured by the Chinese Mint. The Panda coin series is available in both gold and silver. Panda coins were available in 1 Ounce size until 2016, when the Chinese Mint changed the coin denominations to grams. 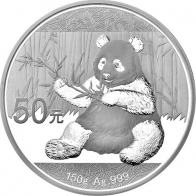 Current issue silver Chinese Panda coins are available in a 30 gram size. Due to the annual update in design and limited minting, Chinese Panda coins tend to appreciate significantly in value over time. Silver Panda coins are available for VAT-exempt Swiss storage or for delivery worldwide.